The finale Grand Prix in the 19-race Formula 1 championship season of 2011, the Autódromo José Carlos Pace or Interlagos race track hosts a late November event which will decide what teams and drivers head into the off-season with confidence for 2012. At one time an early event on the Formula 1 schedule, the Brazilian Grand Prix was bumped to one of the concluding races on the grand prix circuit in 2004. Presented in a country passionate about auto racing, the races on the Interlagos track have a history for producing a memorable outcomes. Won by four different drivers since 2007, the Brazilian Grand Prix's defending winner Sebastian Vettel will start from pole position. Time trial magic becoming patented by Vettel, the German driver flew to a record-setting 15th Formula 1 pole for the season at the 4.309 kilometer Autódromo José Carlos Pace track. Taking the lead in the Q2 session, Vettel piloted his Red Bull-Renault to a stunning Q3 lap of 1 minute, 11.918 seconds. Sebastian Vettel became the only driver in the Formula 1 qualifying session at Brazil to run under the 72-second range. The 15th pole for Sebastian Vettel in his championship-winning 2011 driver title run beats the 1992 mark of 14 poles set by Nigel Mansell. While a nonetheless impressive feat, Vettel was aided by a 2011 Formula 1 season 4 races longer than the 1992 year's run by Mansell driving for Williams F1. Most impressive is the fact the 15 pole positions for Sebastian Vettel combines with the 3 races Red Bull Racing teammate Mark Webber scored the top starting spot. Losing in qualifying on just one occasion at the Korean Grand Prix, the Red Bull-Renault dominated 2011 Formula 1 time trials 18 of 19 races. Beating some forecasts calling for rain, the final Formula 1 qualifying session for 2011 saw the 24-car field unleashed under dry conditions. Vettel's triumph in Q3 resulted in a time 0.179 of a second faster than teammate Mark Webber making it the 6th occasion that the Red Bull Racing team will dominate the front row. While the first row is covered by Red Bull-Renaults, the second row for the 2011 Brazilian Grand Prix will feature the main rivals to Sebastian Vettel's otherwise conquering performance this season. McLaren-Mercedes cars in 3rd and 4th feature Jenson Button ahead of Abu Dhabi Grand Prix winner Lewis Hamilton. The second place team in the manufacturer championship for 2011, rumours have surrounded the McLaren team's future engine supplier with mentions that Honda might want to return to Formula 1 powering the 8-time championship constructor. The Ferrari of Fernando Alonso and Nico Rosberg's Mercedes GP car are deposited into the third row of the Interlagos Formula 1 event. Rosberg's teammate Michael Schumacher qualified 10th for the grand prix breaking into the final Q3 session did not record a time trial run. Pleasing the hometown Brazilian crowd, two popular national sports names will start in the top-10 for the 2011 Brazilian Grand Prix race. Ferrari driver Felipe Massa returns to the Interlagos circuit where he popularly won twice in 2006 and 2008. 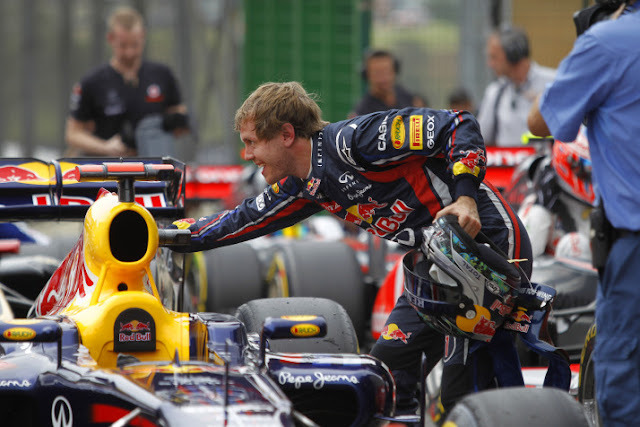 In fact, the 2008 victory at the home track was the last race the Brazilian enjoyed at the top of a Formula 1 podium. Making his second Formula 1 start at Interlagos is Bruno Senna, nephew of two-time track winner and grand prix legend Ayrton Senna. Bruno Senna will start 9th for the Lotus Renault GP team in Sunday's race. Making has 18th Brazilian Grand Prix start, Rubens Barrichello emerged to a 12th place starting position becoming the third and final hometown hero at the final Formula 1 race of the season. For Sunday's Formula 1 race, weather is expected to throw teams for a curve ball for race setup. Weather predictions have up to a 100 percent chance of rain and thundestorms hovering above the Interlagos circuit during race time. Race organizations such as Mercedes GP have expressed the need to keep their options open as weather conditions will become a challenging variable to teams and race drivers. With 71 laps around the 4.309-kilometer Interlagos track, the 2011 Formula 1 will close out starting at 2PM local time or 11am Eastern time.